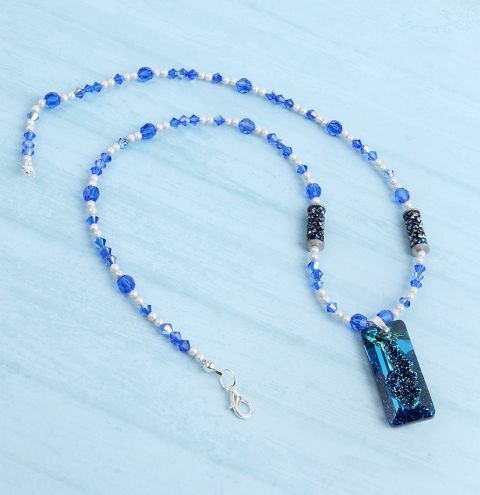 *WANDERLUST COLLECTION* Learn how to make a gorgeous, statement necklace using Swarovski Fine Rocks tube beads, matching Majestic Blue crystals, Dove Grey pearls and a beautiful Growing Crystal pendant. Cut a metre of wire and thread on a calotte finding and a crimp bead. Thread back down through the calotte, missing out the crimp bead and pull the wire to give you a 3cm tail. Crush the crimp bead and close the calotte over it. CLICK HERE to see a video on how to use your calotte and crimp beads. 2 x pearls, 3 x bicones, 2 x pearls, 1 x bicone, 2 x pearls, 1 x faceted round. Repeat this pattern 5 times in total. Next, add 2 x pearls, 1 x tube bead, 2 x pearls, 3 x bicones, 2 x pearls, 1 x bicone, 2 x pearls, 1 x faceted round. Take your Growing crystal pendant and attach your bail to the top. Thread the wire through this bail. Repeat the pattern in reverse to match the first side of your necklace, so it is the same on both sides of the growing crystal pendant. After adding your last 2 pearls. Pick up a calotte finding, and a crimp bead. Thread back down through the calotte and pull your wire through a few more beads. Pull the wire to bring all the beads and findings together so there are no gaps in your work. Crush the crimp bead and close the calotte over it. Trim your excess wire that you threaded through and out of your beadwork in this step. Curl the end of your calotte findings. Attach a jumpring to each end of the necklace and add a lobster clasp to one of these. Feel free to add more jumprings to the ends of the necklace if you want to make it longer, like an extension chain.